Re-reading the Fantastic Four comics from the start. Time to blast off into outer space, for issue #37. With a title like “Behold a Distant Star,” you know we’re in for some serious Silver Age goodness. Back on Earth, Reed has caved to Sue, and announces that the FF will go into space, all the way to the Skrull homeworld, so the Skrulls can face justice for the murder. The next couple of pages are sci-fi technobabble as Reed’s spaceship is able to travel vast distances thanks to a space-time warp. 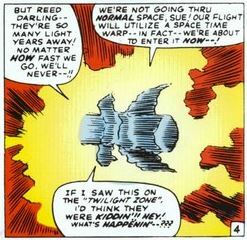 They head to a planet (how they decide on this planet, I’m not clear) where they are ambushed and captured by Skrull soldiers. The soldiers have devices that sap our heroes of their powers. The baddies take the Fantastic Four to Morrat. Morrat frets over what to do with the FF. 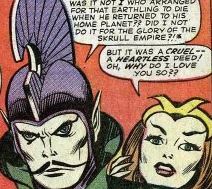 Anelle says he must turn them over to her father, the Skrull king. He agrees, although Anelle says she has trouble believing him. Turns out she was right, because once she’s gone, Morrat announces he plans to kill the FF, which will set him up as the biggest hero in the galaxy. 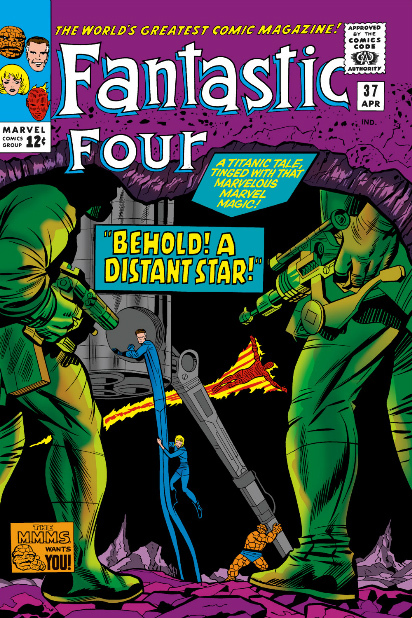 The FF, still powerless, are brought before a Skrull firing squad. Reed pleads for his teammates’ lives, offering all his scientific knowledge in exchange for their lives. With Reed’s smarts, Morrat believes the Earth is his. Elsewhere, Anelle goes to see the Skrull King, who, oddly, is watching a bunch of acrobats perform. He doesn’t trust Morrat, either, fearing Morrat wants nothing but the crown. Anelle mentions the Fantastic Four, only to learn that Morrat didn’t give the FF to the king as promised. The king calls Morrat a traitor and rallies his troops. Back with Morrat, Reed has built another power ray. He turns it on his teammates, acting as if he’s betraying them to the Srkulls. But, no. Remember the start of the issue? The ray boosts the FF’s powers so they’re back to full strength. Time for fighting! Although outnumbered and outgunned, our four heroes plow through the troops. The king shows up, surrounding Morrat. He demands Morrat be arrested, but Morrat calls for the king’s death. The king’s men prepare to fire, as Anelle jumps between them and Morrat. Sue protects Anelle with an invisible force field, but not Morrat, who gets gunned down. Rescuing Anelle softens the heart of the king. Without the power-hungry Morrat, the king says the Skrulls are no longer enemies of Earth, and will leave Earth alone. The FF head back home, just in time for the wedding rehearsal. Fade out: In addition to rescuing the princess, Sue kicks (kicks!) a gun out of a Skrull soldier’s hand during the fight. Clobberin’ time: Once Ben gets his strength back, he benefits from some brilliant Jack Kirby action, ripping apart a giant missile and tossing a whole bunch of Skrulls into the air at once. His past as a test pilot also comes in handy in space. 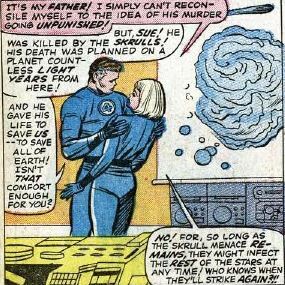 Trivia time: This is the first Skrull story that doesn’t use, or even mention, their shape-changing powers. Fantastic or frightful? What a fun issue. The space setting brings out the best in Jack Kirby’s art, and the story is just plain fun from beginning to end. Loved it. Next week: Ban the bomb!